I earned a bachelor’s degree of science at Virginia Commonwealth University in Richmond, Virginia in Recreation, Park and Tourism and specialized in Recreation Therapy. I worked my entire career teaching and promoting healthy recreation and leisure lifestyles for ages 6 to 100 plus. I began my recreation career as Program Director at a Boys & Girls Club, then a teacher at Fairfax County, and later the Rec. 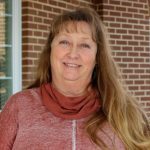 Coordinator for Fauquier County Parks and Recreation. In 2002, seeing a need for recreation services for adults with developmental disabilities, I started my own private practice called “Therapeutic Recreation Experiences”. I spent seven years with Valley Health System at Winchester Rehabilitation Center. I loved coordinating the animal assisted therapy program, music therapy and gardening program. I am excited to bring more than 25 years of recreation programming to HSSL and share my passion for recreation and leisure to foster an open, active and exciting environment that promotes the highest levels of physical, intellectual, spiritual and social independence. I love animals, all recreation, indoors and outdoors, and spending time with my family. I especially enjoy disc golf, camping, reading, Christian music and time on the water. I live in a 200-year-old house in Marshall, VA with my husband of 28 years, 14-year-old son, 13 year old Golden Retriever and 9 year old black cat.